The compact vehicle segment has grown to encompass many types of vehicles, including the uniquely shaped Kia Soul. The Soul offers some versatility to the average, everyday sedan. 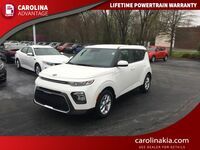 Our team here at Carolina Kia wants to give drivers a better idea of how the Soul stands up to its competition, so we’re putting it head-to-head with the Mazda3 5-door model to get a better idea of what it has to offer. For this comparison, we chose the models that were most comparable, which are the 2016 Kia Soul + and the 2016 Mazda3 5-door i Sport. The 2016 Kia Soul base model comes with a standard manual transmission, but the Soul + comes standard with an automatic transmission like the Mazda3 i Sport model. Both vehicles are equipped with the same size engine, but the Soul comes out on top with more horsepower. 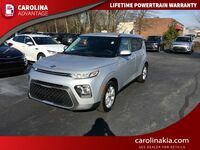 Although the 2016 Kia Soul + has a larger fuel capacity, it is slightly less efficient than the 2016 Mazda3 5-door i Sport. Let’s dig deeper to explore other ways these two vehicles are similar and how they’re different. 24.2 cu. Ft. Cargo Volume 20.2 cu. Ft. 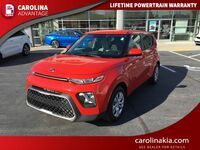 Turning our attention to the overall measurements and capacities, the 2016 Kia Soul + is larger than the 2016 Mazda3 5-door i Sport in most categories. Both vehicles have seating for five passengers. The 2016 Soul offers 101 cubic feet of passenger volume, whereas the 2016 Mazda3 5-door has 96.4 cubic feet. Rear seat passengers in the Soul will have more room than those in the Mazda3. In the Soul, those in the back seat will have 39.1 inches to stretch out and relax. Those in the back seat of the Mazda3 5-door will have 35.8 inches. When it comes to safety, both vehicles have a lot of the same features that are designed to keep both drivers and passengers safe. The Kia Soul + and the Mazda3 5-door i Sport both received five-star ratings from the National Highway Traffic Safety Administration for the front driver crash test. They each received a four-star rating for the passenger crash test. These ratings were made possible by coming equipped with standard brake assist systems, traction control systems, electronic stability control and hill assist control. Other safety convenience features include standard child safety locks and low tire pressure indicators on both vehicles. The Soul + comes out on top with optional heated front seats, leather-wrapped steering wheel and leather seats that are not available on the Mazda3. It also has standard satellite radio and dual illuminated vanity mirrors that are not available in the Mazda3 as well. 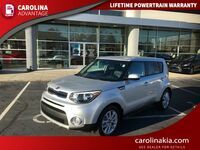 Those interested in learning more about the 2016 Kia Soul are encouraged to contact our team here at Carolina Kia for more information. 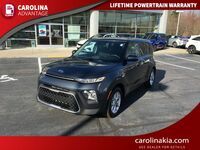 Drivers looking to get behind the wheel of this sporty car can do so by scheduling a test drive online.